I’m going to keep this simple. I’m giving away an ARC of Teardrop by Lauren Kate. -Winner has 48 hours to respond. If winner does not respond, a new winner will be selected. -You must be 13 or older to enter OR have your parents’ permission. -I am not responsible for lost, stolen, or damaged items. Once it’s in the mail, I have no control and, sadly, cannot re-ship anything. *The above giveaway rules were borrowed and modified from Jessica @ Just a Book Lover. With that being said, I wish you luck! May the odds be ever in your favor! Congrats on number 500 :D To another 500 more! Congratulations! You have a great blog, only a matter of time before you hit 1000! Very excited! Thanks so much!!! Congrats Meredith!!! You reached 500 super fast! You better stay friends with me when you become too popular! Here’s to many more followers! Awesome!!! Can’t wait to read!!! Same! It looks so good! Meredith, 500 is amazing! Congratulations! Congratulations and thanks for the giveaway celebration! Congrats on the 500 followers girl!! WOOT WOOT!!!! Party at Mer’s!!! Congrats on the 500!! Love you to pieces <33333 MUAH!!! Awwwww!!! Love you to pieces, too!!! <333333 MUAH!! Your blog was one of the first book blogs I came across just a couple months ago, and after seeing yours and a few others I thought, “I NEED to do this,” so I started my own:) (Let me just say, mine’s not NEARLY as fantastic as yours) Thank you for doing what you do–inspiring all the rest of us to love to read–and keep up the great work! Big congrats on the 500 followers!! Soon enough you’ll be hitting 1K!! I’m hoping Teardrop will be better than Fallen, the cover is SO gorgeous!! I enjoyed Fallen, but I haven’t read Teardrop yet. Thanks for the giveaway! I have been wanting to read this book so bad. Congratulations! Yay for Twitter followers. Yup! It’s awesome! It’s a huge, huge milestone! I can’t get over the cover art for this title. Thanks so much for the chance to win! The cover and title are gorgeous! Congratulations! That’s a big achievement. Here’s to more followers! Cheers! Congratulations on getting 500 followers! You deserve it for having an awesome blog :) Thank you for the giveaway! I entered just in time! Thank you for the giveaway, and congrats on reaching 500 followers on Twitter! 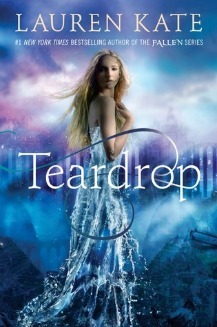 I read the Fallen series by Lauren Kate, which I really enjoyed so I look forward to reading Teardrop! I heard that Fallen is becoming a movie too, so I’m interested to know who the cast members are. I’m so excited for the Fallen movie, too. It looks good so far! !